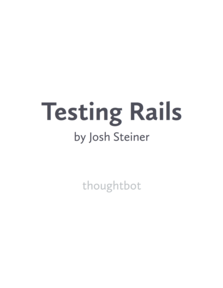 With Rails 3 around the corner, choosing a templating framework (and testing frameworks and ORMs) will be a decision Rails developers can make on even ground. ERb and Haml will be equally supported in places such as generators. A lot of people think Haml is great-looking. Very readable. All those noisy <% end %>s and closing HTML tags are gone. ERb, I imagine you must take all this Haml attention personally. Don’t feel down. Your <body> is a wonderland. The first standard is exactly the same as Haml but the second is intentionally awkward in Haml using the pipe character. Hamlistas will say: move it into a helper. Good point. Then you can go vertical in normal Ruby code. The argument for either framework on looks alone is unfortunately steeped in personal preference. Let’s go deeper. I worked on a Rails project with a PHP developer. I wanted her to learn Ruby, testing with Shoulda and Factory Girl, git, REST… Haml was a lower priority. ERb and immediately felt familiar to her. Lesson: ERb’s interpolated tags are familiar for ASP, PHP, and JSP developers. Haml is under active development. For example, the Haml team recently responded to newer competitor, Less by altering Sass to become a superset of CSS. New ideas and features are being shared and improved upon. ERb isn’t capturing the imaginations of the open source community right now, but is also older and stable. It is working software that you can wrap around yourself like a security blanket. thoughtbot standardized on ERb. Hoptoad was on Haml for a long time but we converted it to Erb. Hashrocket announced they standardized on Haml. Both are examples of companies that work on a lot of apps. I believe the gains from institutional standardization, such as code re-use and developers mastering a common set of tools, outweigh any other pro or con and likely leads to cost savings.